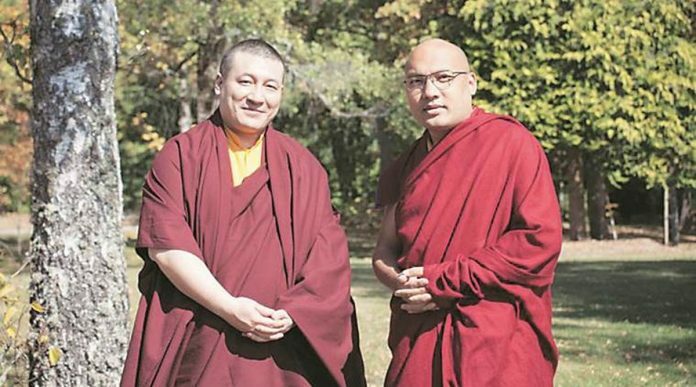 The astonishing news of a meeting between the two Karmapas, Ogyen Trinley Dorje and Trinley Thaye Dorje, in France took the Buddhist world by storm. This is, by far, the most significant development that has happened in the recent history of the esoteric Tibetan Buddhism. Karmapa (Ogyen Trinley Dorje) has made his first major move after he left India last year, and has clearly won the first battle. It comes at a critical juncture, with far-reaching consequences for the Tibetan politics, the Himalayan security and China–India relations. The union of the Karmapas also comes as a big blow to those who probably never wished this to happen, and may have been thrown off balance by this meeting. The Gyalwang Drukpa, head of Drukpa Kagyu, was the first spiritual leader to react and said, “The meeting has set an example of how spiritual masters can resolve internal problems… and wished the younger generation of spiritual masters to follow suit”. Ogyen Trinley Dorje (OTD) has been in the news ever since he disappeared from the radar of Indian intelligence in May 2017. He was later located in New Jersey’s Wharton State Forest area and refused to return to India. He recently acquired the citizenship of Dominica, which may have led to tension within the intelligence circles and in Dharamsala – both tried their best, although in vain, to get him back. A thaw between the Karmapas shouldn’t have come as a surprise. OTD signalled it through a special message sent in March this year, wherein he said he was helplessly witnessing his own sect being torn into rival factions. Among other things, he revealed how his position as a Karmapa was manipulated by others and how he virtually lived a prisoner’s life in Dharamsala (under tight surveillance) and stayed away from his teachers. He also insinuated that attempts were made to push him into playing a political role against his wish and against the interest of the Karma Kagyu unity. The Karmapa also confessed to having run into “disagreements” with the Indian government and regretted having spent 18 years of a “hassled life” in India. The fact that Karmapa had to document his “troubled life” through a special video from the US implied how grave the situation was. But most importantly, he revealed how he even tried in vain to heal the wound and seek “conciliation” by talking to the opponent group, led by Kunzig Shamar Rinpoche (mentor of Trinley Thaye Dorje, TTD), despite people vociferously discouraging him against it. Nothing came out of the meeting, but it comforted him. Rinpoche passed away in 2014, but OTD in his message advised everyone to show respect for the historical line of Shamarpas and refrain from removing him from the supplication prayers. Karmapa shared his feelings with humility and honesty at that time, but no one was clear what he was intending to do. Interestingly, on the other side, TTD announced the birth of his first child, a boy, on 11 August 2018, in France. Earlier in March, TTD had hinted that the coming child could be the reincarnation of Shamar Rinpoche. OTD may have foreseen the potential problems arising from a situation of having two different reincarnations of Shamar Rinpoche, which would further damage the unity of his sect. This may have pushed him to seek conciliation with TTD, and prompted him to travel to France – ideally suited for a meeting, away from the gaze of Dharamsala. It is unclear whether the Karmapas discussed the issue of selecting the next Shamar Rinpoche. As for settling the Karmapa title, both would possibly recognise the other as ‘emanation’ or ‘manifestation’ of self – probably acceptable in an esoteric tradition, along the lines that ‘the union of two rays always becomes a line’. Of course, it is too early to speculate a final settlement, given the disputes over shared property, especially the fate of Rumtek Monastery in Sikkim where the “sacred black hat” is lying. A lawsuit has been filed by the rival groups – Tsurphu Labrang (supporting OTD) and the Karmapa Charitable Trust (supporting TTD). Also, whether the factions at the lower ranks would accept a deal is another issue. In the months ahead, it needs to be seen if the rival factions will hold a joint Kagyu Monlam (main annual prayer), held in Bodh Gaya every February-March. One thing is certain: Kagyu lineages are no longer going to accept interference in their intra and inter-sectarian affairs. A critical issue is whether the Karmapa would turn up for the upcoming meeting of Pot-lha-chen (heads of Tibet religious sects) in Dharamsala in November – ostensibly to decide the Dalai Lama’s future. Should he fail to attend it, the so-called united face of Tibet would take a serious hit. The coming together of the Karmapas would certainly prove to be good for peace and stability in the Himalayan region, Sikkim and Ladakh in particular, where people have been split by the claim to the title of Karmapa. Unlike OTD, Thaye Dorje is not recognised by the Dalai Lama and Beijing. But, he has a large following in both India and Bhutan. It is unlikely that OTD has any insidious plans, but he may still fear not getting a fair deal if he returns to India, especially in terms of free movement. The deck seems to have been cleared to offer OTD a plot in New Delhi to build a Buddhist centre. TTD already has a centre at the Qutab Institutional Area in New Delhi. The Indian government should allow the issue to be handled by people who have a sound grasp of the deeper nuances of esoteric Buddhism than just sleuths. P.Stobdan, seemingly a Lhadaki and fairly well-informed individual in the context of Himalayan Belt affairs. I have seen his writings, lucratively made speculations on Tibet and Tibetan affairs – I do not quite see any reason to agree on many of them. Pertaining to the keywords – word-to-word translation of Karmapa Ogyen Thinly Dorjee’s interview on Tibetan media, are not reflected authentic. The way it is commented and conceptualized in his own narrations and perspectives disregards how OTD gratified Indian Government for Tibetans. Discomfort is experienced by any foreigners in a foreign land and I am of no exception but at the end, I can not express how grateful am I to the Indian government.